Program Productions, Chicago-based labor-services provider to the sports, entertainment, and broadcast industries throughout the U.S. and Canada, is partnering with the Conservatory of Recording Arts and Sciences (CRAS), a major educational institution focused on professional audio and specializing in preparing entry-level workers for broadcasting. Under their agreement, Program Productions will place appropriate CRAS broadcast students, facilitating possibilities for up-and-coming broadcast-audio engineers. Located in Tempe, AZ, CRAS has pioneered professional audio education for 30 years and, in recent years, has emphasized audio for broadcast sports. 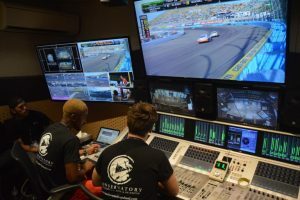 Its 42-ft. expando remote-production unit is used as a teaching lab for sports audio and is often connected with the remote-production units of major networks, including Fox Sports, for MLB Arizona Diamondbacks games and NASCAR races at ISM Raceway. The school has built online training portals for Harman’s Studer brand of Vista audio consoles and Audiokinetic’s Wave Works Interactive Sound Engine (Wwise) audio-authoring tool for videogames and this year launched an online portal on behalf of Dolby for its Atmos immersive format. That’s in addition to running an 11-month certification program in music production, broadcast sound, game audio, live sound, and audio for film and television. The Program Productions venture will expand availability of internships and placement for CRAS graduates. With 10,000-plus technicians in its database, Program Productions provides staffing for such clients as Fox Sports, Turner Broadcasting, NBC Sports, NBC SportsNet, MLB Network, NFL Network, SNY, NESN, YES Network, Mobile TV Group, NEP, AT&T SportsNet, All Mobile Video, and the USGA. According to CRAS Administrator Kirt Hamm, the partners’ relationship goes back several years, with Program Productions helping move some graduates of the school’s 36-week program into 12-week-long internships, including with Game Creek Video and All Mobile Video and the Chicago Bulls and Blackhawks teams. The new partnership, he said, represents an expansion of that. Students get hands-on training in broadcast-audio production in CRAS’s mobile unit, here at a NASCAR race. He notes that the school has invested heavily in audio for broadcast-sports applications, in part because, in past years, several broadcast-industry leaders have communicated their concern about the lack of a pipeline of trained entry-level job candidates. The CRAS broadcast-audio educational module was developed with input from Fox Sports Audio Consultant and 14-time Emmy Award winner Fred Aldous. However, Hamm adds, broadcast sports’ uptake of CRAS graduates with the appropriate skills has been less than hoped for, in part because the larger broadcast business has historically aligned its entry-level intake with traditional June college graduation schedules. That, he asserts, results in far fewer openings during the rest of the year for CRAS graduates at the end of their nine-month course terms. He expects the expanded Program Productions partnership to sidestep that problem.